Alert! Alert! One pound (454 g) bags of large shrimp are on sale for $4.99 at the Atlantic Superstore (in Nova Scotia) from now until Thursday, August 2. Stock up – that’s $5 off their regular price. 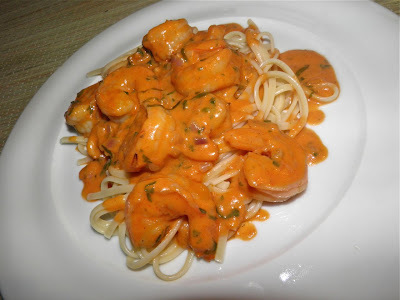 I was almost certain that I had posted this recipe last year, but I’ll be darned if I can find it. Since it’s such a good one — and shrimp are ocean bottom price — I’m taking the risk and posting it now. 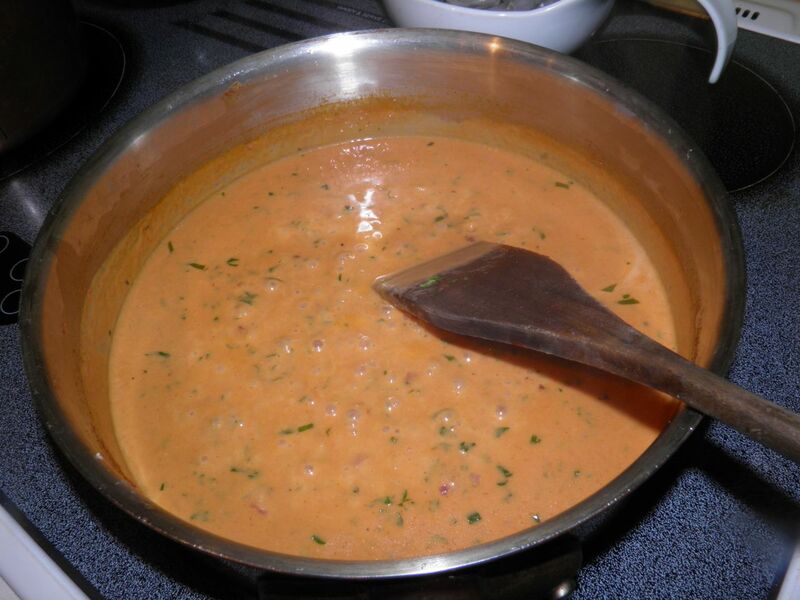 Vodka sauce for pasta is exactly what it sounds like – a pasta sauce made with vodka… a lot of vodka. 1/2 cup to be exact. Or at least my recipe takes that much. The vodka in the sauce enhances the favour of the tomatoes. Certain flavours are only alcohol-soluble which means you can’t taste them unless dissolved in alcohol. Vodka is used because it doesn’t add other flavours to the sauce, like vermouth or brandy would do. So the end result is a more intense tomatoey flavour. San Marzano (the prince of Italian tomatoes) would be ideal, but the vodka can also improve lesser tomatoes as well. The exact origins of pasta with vodka are muddy. The original dish was penne alla vodka and there have been multiple claims to the invention. One source says it was invented in Bologna, Italy in a restaurant called Dante. Other culinary historians cite a man called James Doty, an American, for its invention. Another claimant, Luigi Franzese of Naples, supposedly made the first version which he called penne alla Russe because of the vodka. It was served at his New York restaurant Orsini in the early 1970s. What is known is that in the 1970s there was a push by vodka distillers to increase their market share in Italy. So who knows. It doesn’t really matter. This is one great sauce. Can you get “sauced” by eating sauce? Alcohol does not entirely burn off when cooking, regardless of what you may have read in other places. You would have to cook for a very long time to reduce the alcohol content to zero. So any sauce that uses alcohol will retain some in the finished product. This sauce cooks very quickly so you will still have a lot of alcohol content in this. My recipe is different in a few ways from the “traditional” versions. Instead of tomatoes I use tomato paste. Also, there is always a spiciness to the sauce, most times chilli flakes. I use cayenne, but feel free to substitute. Try this sauce. If you’ve never had it, you’ll be pleasantly surprised. Mmmm...... that's all I can say. This is just before the shrimp go in. Heat the olive oil in a wide flat saucepan. Sauté the garlic and onion for a few minutes until they soften slightly. Add the vodka, whipping cream and tomato paste. Bring to a boil and let cook until it reduces by about half. Stir in the cayenne, parsley and basil leaves. Then add the shrimp and let cook just until they are no longer pink, about 4 minutes. Serve on linguine with crusty Italian bread.